By John W Whitehead – Constitutional attorney, Charlottesville, Virginia: For too long now, the American people have allowed their personal prejudices and politics to cloud their judgment and render them incapable of seeing that the treatment being doled out by the government’s lethal enforcers has remained consistent, no matter the threat. Take Roger Stone, one of President Trump’s longtime supporters, for example. This is a guy accused of witness tampering, obstruction of justice and lying to Congress. As far as we know, this guy is not the kingpin of a violent mob or drug-laundering scheme. He’s been charged with a political crime. So what does the FBI do? They send 29 heavily armed agents in 17 vehicles to carry out a SWAT-style raid on Stone’s Florida home just before dawn on Jan. 25, 2019. They pound on his door, point automatic weapons at him, and terrorize his wife and his dogs. Overkill? Sure. Yet another example of government overreach and brutality? Definitely. To be clear, this is far from the first time a SWAT team has been employed in non-violent scenarios. SWAT teams have been employed to address an astonishingly trivial array of so-called criminal activity or mere community nuisances: angry dogs, domestic disputes, improper paperwork filed by an orchid farmer, and misdemeanour marijuana possession, to give a brief sampling. In some instances, SWAT teams are even employed, in full armament, to perform routine patrols. 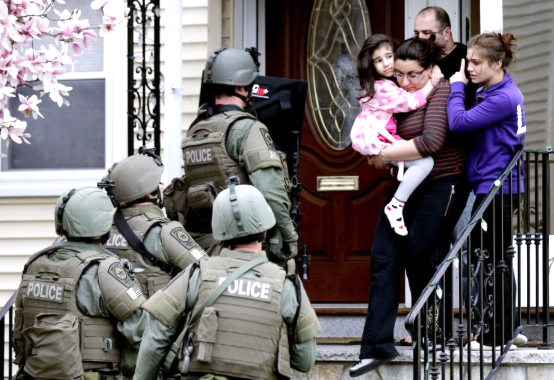 In 1980, there were roughly 3,000 SWAT team-style raids in the US. Incredibly, that number has since grown to more than 80,000 SWAT team raids per year. Police in both Baltimore and Dallas have used SWAT teams to bust up poker games. In Arizona, a SWAT team was used to break up an alleged cockfighting ring. An Atlanta SWAT team raided a music studio, allegedly out of a concern that it might have been involved in illegal music piracy. A Minnesota SWAT team raided the wrong house in the middle of the night, handcuffed the three young children, held the mother on the floor at gunpoint, shot the family dog, and then “forced the handcuffed children to sit next to the carcass of their dead and bloody pet for more than an hour” while they searched the home. In some cases, officers misread the address on the warrant. In others, they simply barge into the wrong house or even the wrong building. Unfortunately, the shock-and-awe tactics utilized by many SWAT teams only increases the likelihood that someone will get hurt. Indeed, “terrorizing” is a mild term to describe the effect on those who survive such vigilante tactics. Yet this type of “terrorizing” activity is characteristic of the culture that we have created. The Global Rise of Fascism: Capitalism’s End Game?